← Global festival horror assaults | EFF attacks Vodacom shops | GOOD grief | SA to host Afcon 2019? President Cyril Ramaphosa this afternoon appointed Shamila Batohi to the critical role of National Director of Public Prosecutions (NDPP). She replaces the axed Shaun ‘The Sheep’ Abrahams, who became notorious during the Jacob Zuma era for turning a blind eye to graft. Besides going after baddies, Batohi will need to restore the National Prosecuting Authority’s credibility, which has been undermined by years of political interference. Ramaphosa acknowledged as much by saying: ‘In appointing a new NDPP, we are addressing the state of dysfunctionality and deficiencies in the NPA identified by the Constitutional Court. The NDPP occupies a vital position in our democracy and makes an essential contribution in upholding the rule of law.’ Batohi became a well-known South African figure when she acted as evidence leader during the King Commission investigation into Hansie Cronje’s cricket match-fixing. Recently she was a senior legal adviser at the International Criminal Court in The Hague. The National Assembly this afternoon voted by 209 to 91 to adopt the controversial Constitutional Review Committee report recommending that Section 25 of the Constitution be amended to allow for the expropriation of land without compensation. The ANC’s chief whip Jackson Mthembu will table a motion on Thursday to take the process forward – today’s vote was the first step in what will in all likelihood be an extended legislative process. There’s been a scarcity of good news around recently, but here is some: GDP figures for the third quarter of 2018 were released by StatsSA today, showing the country has managed to move out of its technical recession with 2.2% growth. GDP was at -0.7% in Q2. The rand strengthened on the news. Let’s hope it carries on moving in the right direction through the holiday season. The EFF and Vodacom met today after supporters of the former had trashed stores of the latter. Vodacom’s sin had been to sponsor an event where Corruption Watch chair Mavuso Msimang – exercising what is commonly known as freedom of speech – had criticised the EFF’s leadership (among many others – see the speech and Msimang’s response here courtesy of the Daily Maverick). A joint statement issued after this morning’s meeting said the issue had been resolved and the matter was now closed. In another development today alleged tobacco smuggler Adriano Mazzotti – who has funded the EFF in the past – denied there was anything improper about Malema’s wife and children staying in a house he owns. He said she rented the property at a market-related price, but would not say how much. The house is estimated to be worth R7-million. Anti-fuel tax demonstrations held by French protest movement the gilets jaunes (yellow vests) turned violent three weeks ago and more than 100 people have been injured in subsequent clashes. You can read all about the movement and the issues at play courtesy of The Guardian. Two days after the Global Citizen Festival at FNB Stadium, CCTV footage has emerged showing a five-hour crime spree at the garage opposite the venue. People had gone to the garage to wait for transport but were mugged, attacked, stabbed, threatened at gunpoint and sexually harassed. Traumatised festival goers have shared their appalling experiences. So where were the police? They have claimed they had a strong presence at the venue. At the same time as the Global Citizen fiasco, looters in the Cape Town CBD were also causing havoc. After the Adderley Street Festive Lights Switch-On ceremony on Sunday marauders broke into Rook Cycles in Long Street stealing and causing damage of about R170 000 in mere minutes and at least 15 cases of robbery were opened at Cape Town Central police station. There are two sets of menaces today – the thugs who perpetrated the crimes and the indifferent police officers who didn’t try to stop them. The police are either pathetic or apathetic. Probably both. Newly appointed Communications Minister Stella Ndabeni-Abrahams has leapt straight into battle at the SABC, where she has reportedly ordered the board to review its cost-cutting plans to retrench 981 permanent staff and 1,200 freelancers. The Minister then cut ties with the Board when it objected. News24 reports that the new minister wants to ask Finance Minister Tito Mboweni for help before retrenchments start but the board says it will run out of money for salaries as soon as February. The DA’s Phumzile van Damme issued a statement today saying that board deputy chair Khanyisile Kweyama and board member John Mattison had resigned – but had not yet submitted resignation letters – and that the party was ‘reliably informed’ that another board member, Krish Naidoo, had been asked by Luthuli House to step down but had not done so yet. It is not clear whether the resignations have anything to do with the minister. The PIC’s annual report has revealed that it has written off over R7-billion of investments for the 2018 financial year. The largest write-off was for the state pension fund manager’s investment in Steinhoff’s empowerment partner, Lancaster. The R1,06-billion loan to Iqbal Survé’s Sekunjalo Group was also written off after the company failed to pay an agreed sum of R253m in August, apparently arguing that trading conditions had been tough. Renosi Mokate, chair of the Government Employees Pension Fund board of trustees, said in a statement this investment is still being monitored. The PIC also wrote off investments of R375m in VBS, and R492m in Afgri Poultry. Real Madrid and Croatia midfielder Luka Modric broke the Cristiano Ronaldo/Lionel Messi stranglehold on the prestigious Ballon d’Or when he was named as the world’s best footballer yesterday evening. It was the first time in 10 years that Ronaldo or Messi had not won the award. Paris St Germain’s French forward Kylian Mbappe collected the Kopa award for the best under-21 player. Olympique Lyonnais’ Norwegian striker Ada Hegerberg won the inaugural Ballon d’Or for women’s football but her award was overshadowed by the French DJ Martin Solveig asking her to twerk. Premier League teams Arsenal and Tottenham Hotspur have both been charged by England’s Football Association with failing to control their players after Sunday’s north London derby degenerated into a mass brawl. Spurs midfielder Eric Dier’s goal celebration sparked angry scenes on the touchline, with Arsenal’s substitutes unhappy with the England player. Sierra Leone was yesterday kicked out of the Africa Cup of Nations qualifying tournament due to government interference. Fifa are strict on ensuring there is no political interference in any way in football and yesterday, through CAF, they disqualified Sierra Leone and annulled its results in qualifiers it has already played. CNN correspondent Muhammad Lila has posted a 30-second clip of the moment during the signing of a new trade deal between the US, Canada and Mexico at the weekend’s G20 meeting when it dawns on each of the heads of state present that US President Donald Trump has signed his copy of the document in the wrong place. It is priceless. Nigeria’s President Muhammadu Buhari has denied claims that he had died and was replaced by a clone, breaking his silence on a rumour that has been circulating for months. Buhari is hoping to be re-elected in February. He spent five months in Britain last year being treated for an undisclosed illness, which sparked rumours that he had died and had been replaced by an imposter from Sudan called Jubril. ‘It’s the real me, I assure you,’ Buhari told Nigerians in a meeting in Poland on Sunday, where he was attending a conference. Denying being a clone is exactly what a clone would do. 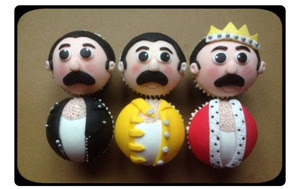 These Freddie Mercury Mercury cupcakes look delicious. I want to bake three. The solution to yesterday’s radical clue, Kind of revolutionary vegetable? (6), is RADISH – if you are a ‘kind of revolutionary’ you are rad-ish! Who can know what shape this country would be in now if Jacob Zuma’s pliant appointees as National Director of Public Prosecutions (NDPP) hadn’t turned a blind eye to the looting under the former president’s watch? A properly functioning National Prosecuting Authority (NPA) would surely, for example, not have given the Gupta family a free hand to plunder state-owned enterprises, government departments and, well, just about anywhere that could help line their pockets. Today’s appointment of a new NDPP is therefore an extremely important step towards setting us back on the right road. By all accounts, Shamila Batohi, is a good choice. She has loads of experience and, importantly, the fact that she has been working abroad (at the International Criminal Court) means she is not tainted by the political tensions that battered the NPA in recent years. She also appears to be tough, a vital character trait in a job where she will make some powerful enemies. In the circumstances this might be one of Ramaphosa’s most important appointments and Batohi’s success or otherwise will play a significant role in determining the future trajectory of the country.